I had come across a 3 minute animation showing extracts from the graphic biography of Anne Frank that I wanted to show students, but I thought that language might be a bit difficult for them. The research, sharing, visually organizing, and writing activities that we first worked on, and that I wrote about in the previous post, paved the ground for stepping smoothly into watching the animation. I prepared a worksheet with 10 events from the video and jumbled them up. 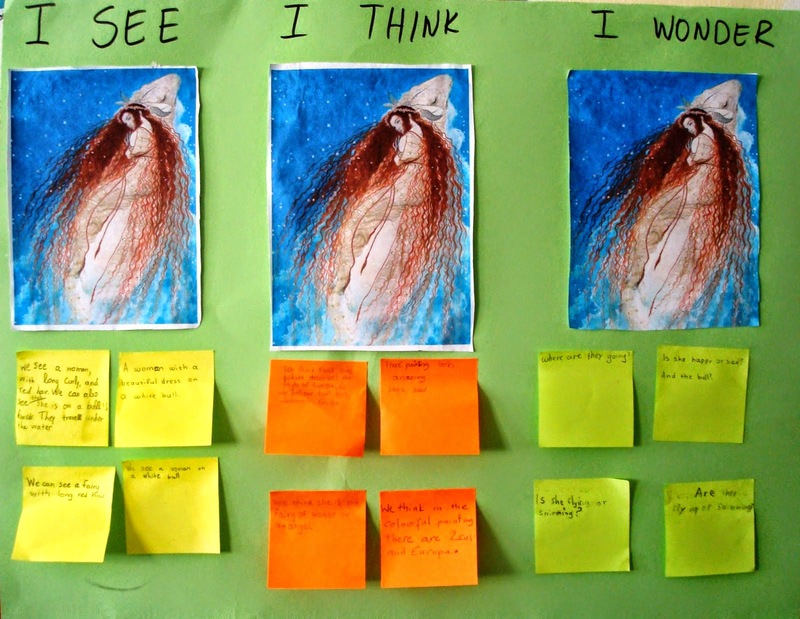 This is an activity drawn from Kieran Donaghy’s excellent resource Film in Action. Students watched the video twice and they ordered the events as they appeared in the animation. 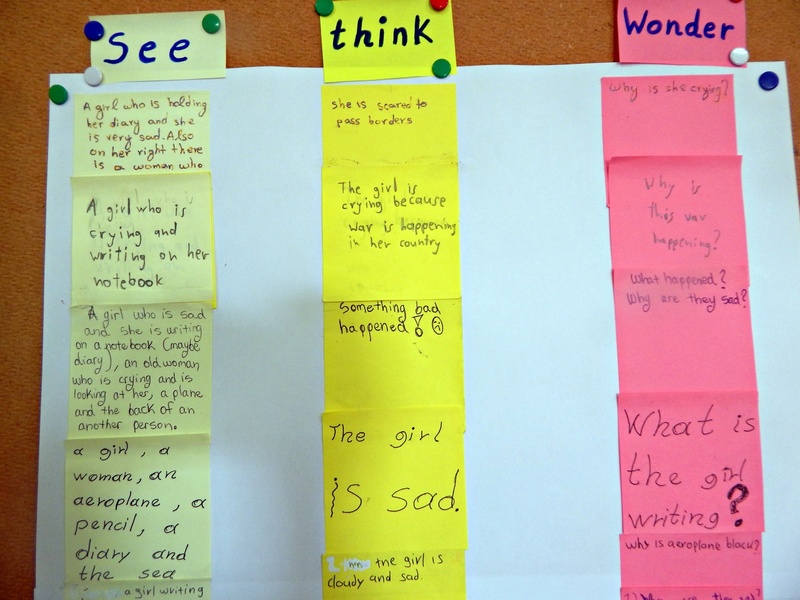 On finishing the lesson, I asked students to choose the most important thing from Anne’s story and communicate their ideas in both verbal and non-verbal ways. A wealth of hand made drawings and digital work was brought in class. 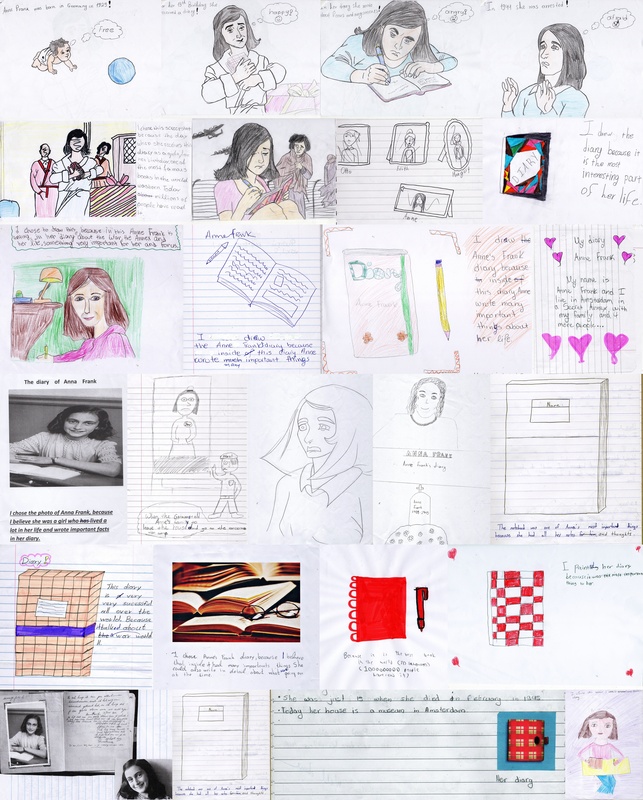 Many students chose to draw Anne’s diary associating it with her life events and her writings about the war. Others drew Anne herself writing in her diary and the importance of what she wrote not only for herself, but also for us, as future generations. A student drew Anne with a “Jew” badge on her chest the moment she was arrested by the Nazis. There was also a group of students who had chosen to work on this collaboratively and came up with a series of 4 portraits of Anne capturing all the important events in her life. These portraits were inspired by the imagery in the animation and were linked to four relevant life moments. Each portrait was related to her state and feelings starting from birth when she was free, moving to her receiving the diary (happy), hiding and writing in the Annex (sad, angry) and finally being arrested (scared). that were important, meaningful, powerful or moved them. I also encouraged them to justify their choices. Some students chose their sentence, phrase, word from the first excerpt, some from the second, while some from the third. Some others tried choosing from more than one excerpts and some made one choice from each excerpt. Finally, some students chose only one or two of the stems (sentence or phrase or word). I realize that this activity requires a deep, personal insight into a topic which is not an easy one, let alone when you have to express yourself in another language. Students’ answers were touching and showed an admirable effort to offer their personal interpretations on Anne’s writing. By the time, we reached the end of our work, Anne Frank and her diary had become a topic of everyday discussion whether we had a class together or not. I can even say that I was slighlty surprised by the impact it had on the students. Books bought were brought in class, others had already been ordered, excerpts from their Greek language textbook on Anne Frank were discovered and they asked their Greek language teacher to work on them; students were sharing among themselves youtube addresses where they could watch and find out more about her. It was great to see the resonance of her story with the children. I believe it genuinely touched them. 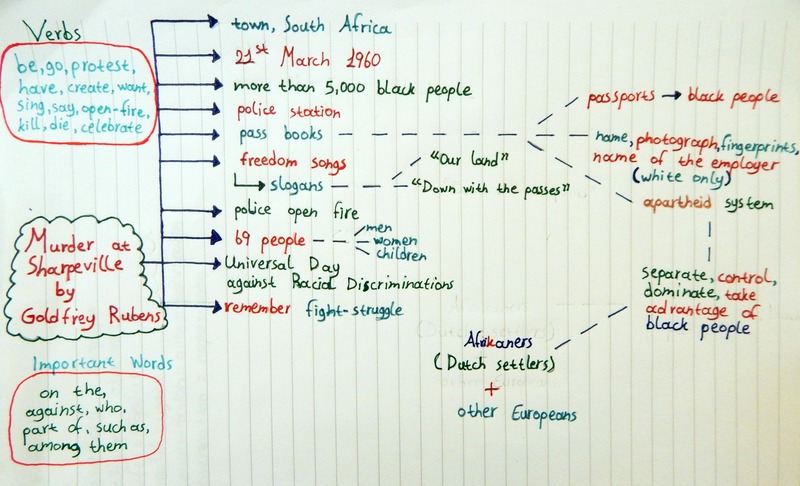 Some diary excerpts from previous decades that were in our coursebook sparked the idea of dealing with the most widely read diary: the diary of Anne Frank. 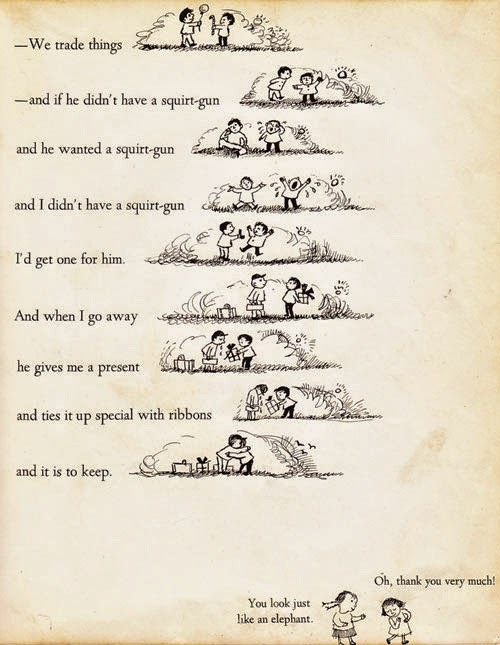 Not a happy ending story, yet one that I felt is important for my young sixth graders (A2, eleven year-olds) to know. It can trigger thinking about injustice and discrimination, about where hate can lead, and stimulate empathy for others through a real story of a girl close to their age. They took notes of their ideas. I went round the classroom and offered help with language when needed. Some asked for words like “wires”, “torn”, “borders”, “bent” (shoulders). One needed help clarifying between “die” and “kill”. 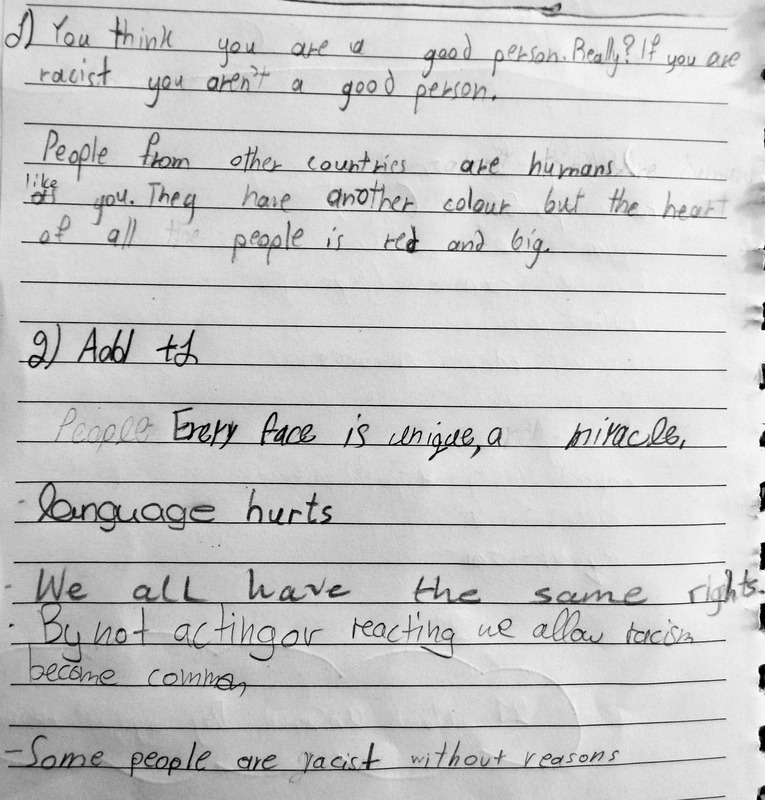 We shared our ideas in class. 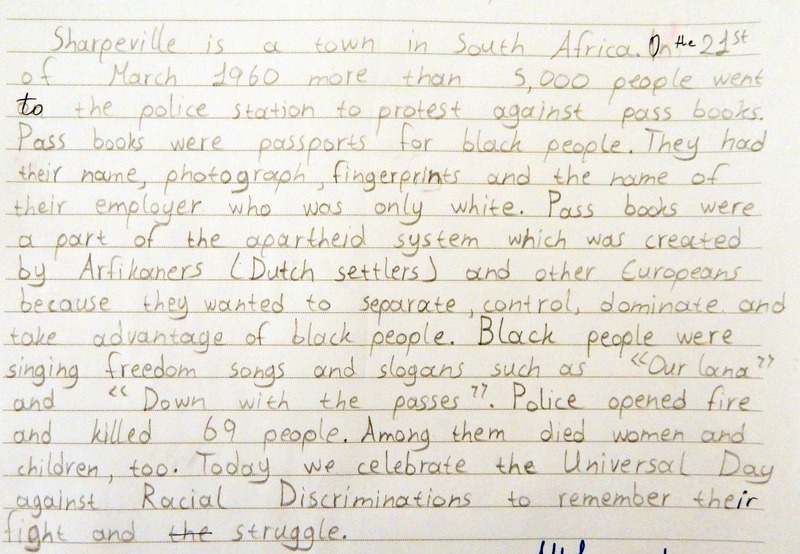 They fact that the girl in the image was writing a diary was a prominent answer among most of the students. They identified the feeling of sadness in the girl’s face and made associations with a war situation. Two of the students straightly associated the image with World War II because the shape of the airplane reminded them of similar airplanes they had seen from that period. A student used the word “cloudy” to describe her thoughts about the girl and word choice made me smile. I found it creative and unexpected. They also hypothesized about the relationship between the two female figures. Some thought the woman at the back was the girl’s mother, others her grandmother. A couple of them thought that the people were refugees trying to cross the borders because of the wired fence at the back and their torn clothes. 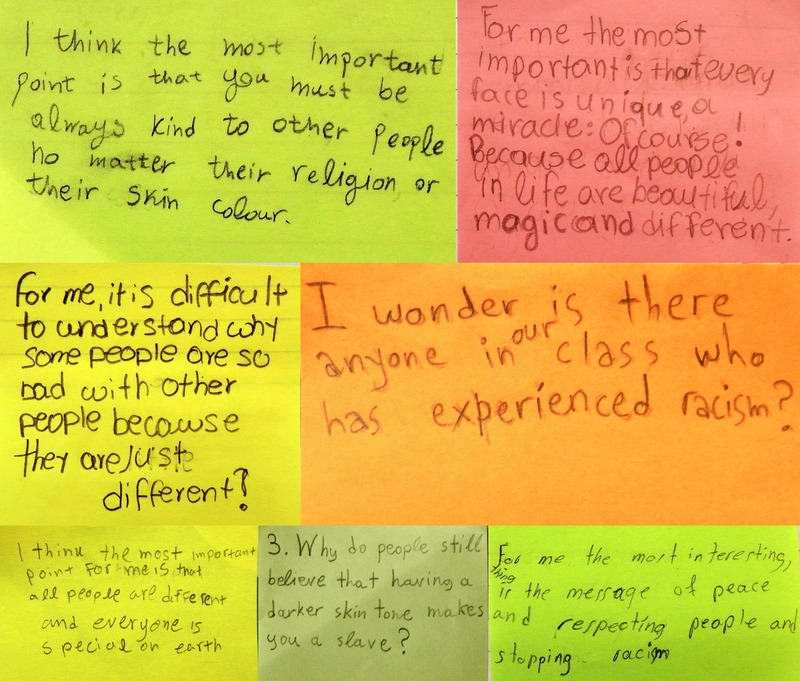 Students’ questions embraced all the who, where, what and why relevant to the topic: Who are these people? What is the girl writing? Why is this war happening? Why are they sad? Where are they? I took some notes of their ideas on the board and encouraged students to do the same in their notebooks. By the end of the session they were more than curious to find out who the girl in the image was. I revealed her name and wrote it on the board: Anne Frank. Some of them went bright-eyed. Two had the Greek translation of the book at home, but had never read it. One said he was a member of an amateur theatre club and he remembered once talking about staging a performance of this play, but not doing it in the end. A fourth one had been to the theatre with her parents and had attended a professional performance based on Anne Frank’s life. She could not remember many things though. A vague familiarity with the cloudy girl in the image began to spread in the classroom. I asked them what they knew about Anne Frank and three things came up: she was writing in her diary about the war, she lived in Germany, she was a Jew (that was a word that they knew in Greek, and I provided them with the English equivalent). When they asked what Jew means, I explained in simple terms that it is a religion. Write a short paragraph about the lesson, based on their notes and class discussion. Research, read about Anne Frank (reading could be done in either L1 or L2) and come back next time with 4-5 sentences about what struck them as most interesting. Until our next session, I was pleasantly surprised and happy to see students come and find me before the morning assembly or during breaks to report either that they had started reading the book or that they had asked their parents for a copy. Those who had started reading it were amazed to find out how many things Anne could not do because she was a Jew. 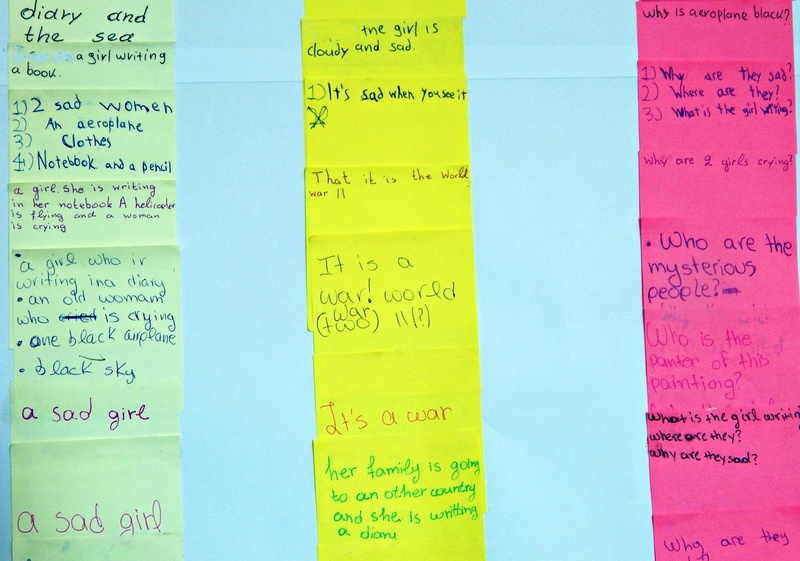 In our second session on the topic, individual students initially read their paragraphs and some feedback was given. Then, they started sharing their choices of sentences. I knew that not all students would come up with the same things. I trusted that from the multitude of sentences we would manage to create an as complete as possible picture of Anne’s story. I also had in mind of asking them at the end of the session for a writing assignment that would incorporate all the elements shared in class. I decided to organise the information into a more visual form to illustrate the connections and relationships between various aspects of what we were discussing. 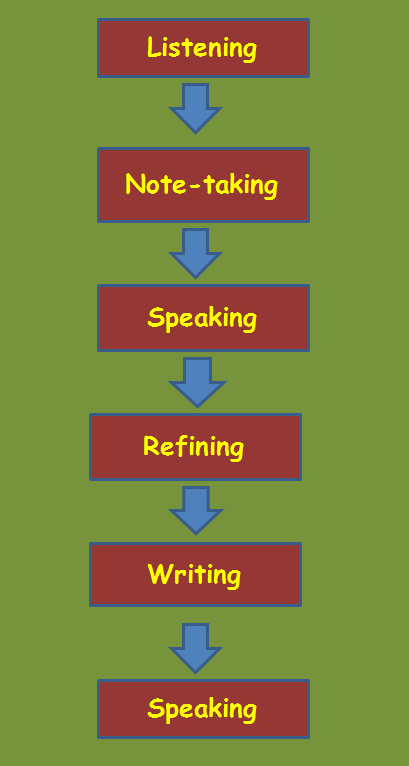 I hoped to enable students to refer to, relate between information, and help the writing process. 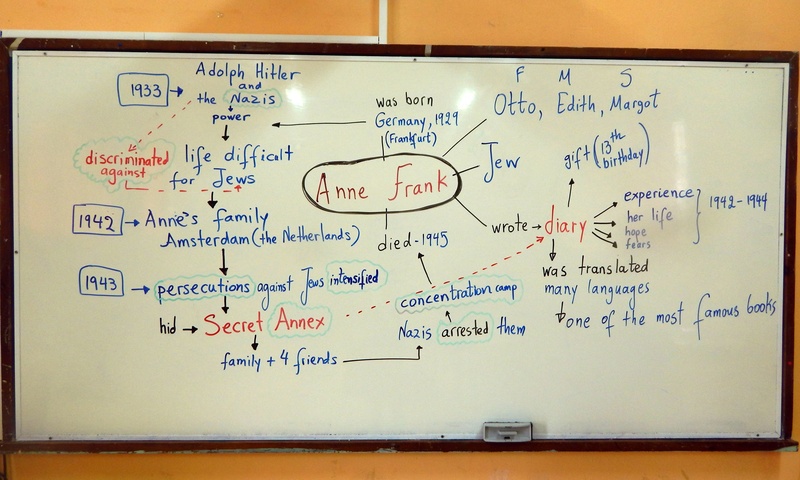 The diagramme was built around the first 4 sentences that were read in class, namely that she was born in Germany, she was a Jew, she wrote a diary and that she died in 1945. From thereon I intervened at times and facilitated building the story by asking some questions and seeing whether students had written a relevant sentence. For example, I asked “What was happening in Germany at the time Anne was born?” and a student had written a sentence about Adolph Hitler and the Nazis coming to power. That’s how the left part of the diagramme started being formed. The next question was “Why was this important for Anne?” and someone else had written that the Nazis discriminated against the Jews and made life difficult for them. I went on by asking “So, what did Anne’s family do?” and we found out that they moved to the Netherlands. “Were they safe there?” was the next question to get the answer that “no” because “persecutions against the Jews intensified”. We finally reached the point where the family hid in the Secret Annex with four other friends. The Secret Annex was linked to her writing the diary and the people were linked to the aftermath i.e that the Nazis arrested them, and they were taken to a concentration camp where Anne died. Which brought us back to one of the first four sentences. While writing on the board, I used colour coding: blue for the information, black to highlight verbs used, red for things of importance, and finally a green contour around new language. This was language students had included in their sentences, but other students were not familiar with since each one had come up with different sentences. It’s interesting that in the group of sixth graders where the students who had the book were in, we were able to have more details about the discrimination issue. It was something that made a strong impression to the students who had read about all the things that Anne could not do because she was a Jew. It made an even stronger impression to their classmates to hear about all the prohibitions Jews were subjected to. In both classes, at the end of the session, I asked students to draw on the diagramme and retell the story. We did this as a relay race. One would start, I would say stop, another student would take up from that point and go on with the story. We tried this two or three times and it went well. Students left the class to do their writing assignment feeling quite confident about it. I left thinking about the next stage of the topic which is still going on and I hope to write about it in a next post. Description: This lesson proposal is organized around the theme of friendship. 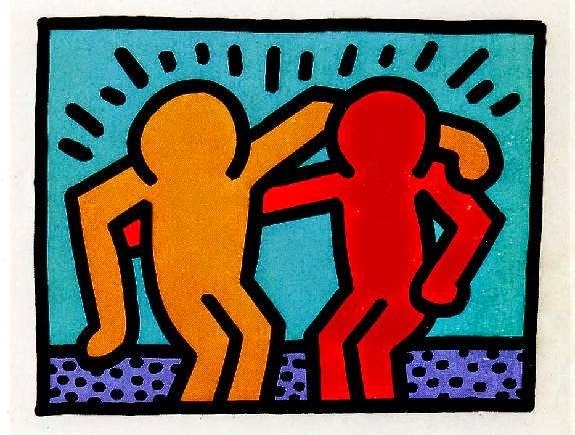 Source material: Best Buddies, a painting by Keith Haring, a short extract from Ruth Krauss’s book I’ll Be You and You Be Me, an extract from Hans Christian Andersen’s The Ugly Duckling, and Broken Wing, a short animation film by Amos Sussigan. The thinking routines used are: 3-2-1 Bridge, Sentence-Phrase-Word and Headlines. Skills: Observing, describing, discussing, watching, note taking, linking prior knowledge with new ideas and thoughts, engaging with meaning from text with a particular focus on “what speaks to them”, capturing and summarizing the essence of a topic. Step 1 Show students Best Buddies by Keith Haring. Ask them to describe it and guess the title. Reveal the title of the painting and the name of the painter. 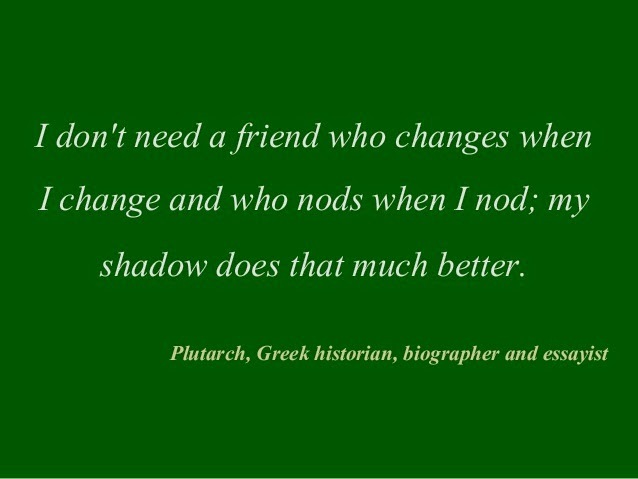 -What qualities do you think are important in a friend? -What things should friends never do? Have them discuss the questions in pairs or in groups. Get feedback in the form of a plenary discussion. Step4 Show students the 2 slides from Ruth Krauss’s book I’ll Be You and You Be Me. Read them aloud in class. Discuss what they think the important ideas in the poem and the quote are. Give students the extract from Hans Christian Andersen’s The Ugly Duckling. You might consider reading the extract first to the students. Then, have them read silently. A sentence that is meaningful to them, that they feel expresses a main idea of the text. A phrase that moves or engages them. A word that has caught their attention; that they think it is powerful. Note: Students can start with any item they like (sentence, phrase or word) and they can also skip an item if it does not work well (phrase might be a bit confusing). -Are there any common themes that have now emerged? -Why do you sometimes don’t want someone to be your friend? -How do you treat a non-friend? Step6 Write on the board: A friend in need is a friend indeed. Ask students what they think the proverb means. 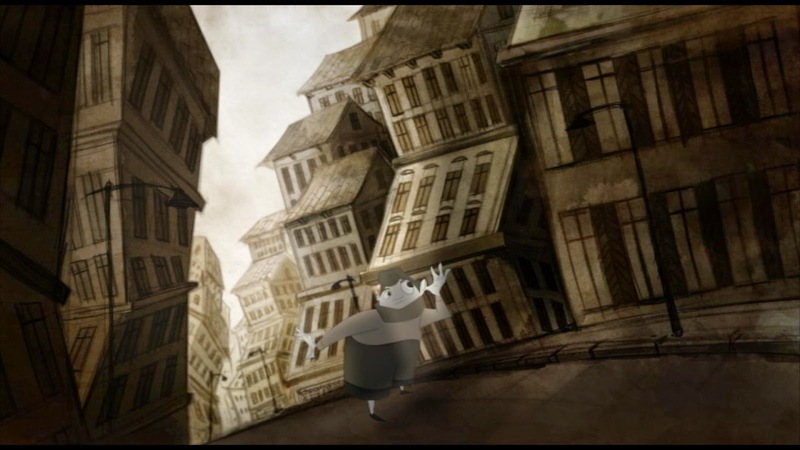 Show students this image from the Broken Wing animation film. Ask them how the image makes them feel and why. Then show them the next image from the film and do the same. Ask them to compare the two images and say how they are different. Then ask them to guess what story the film might tell. 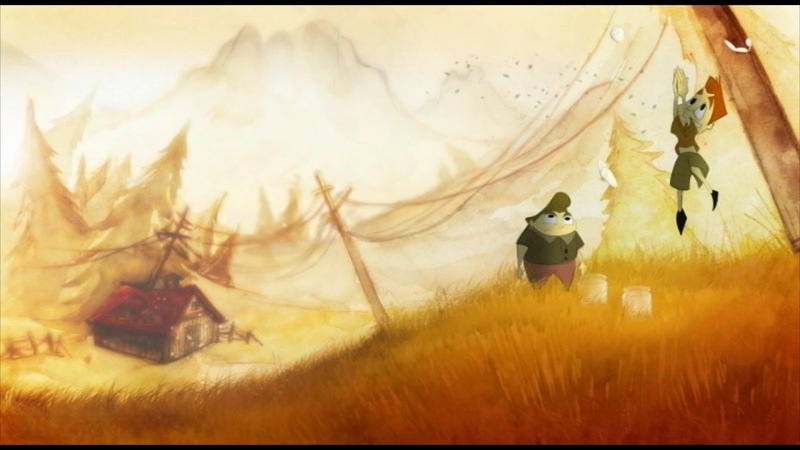 Tell students that the images are from a short film called Broken Wing. Tell them that after watching they will have to write a short narrative of what happens in the film. Show the film. Broken Wing [Film] on Vimeo. 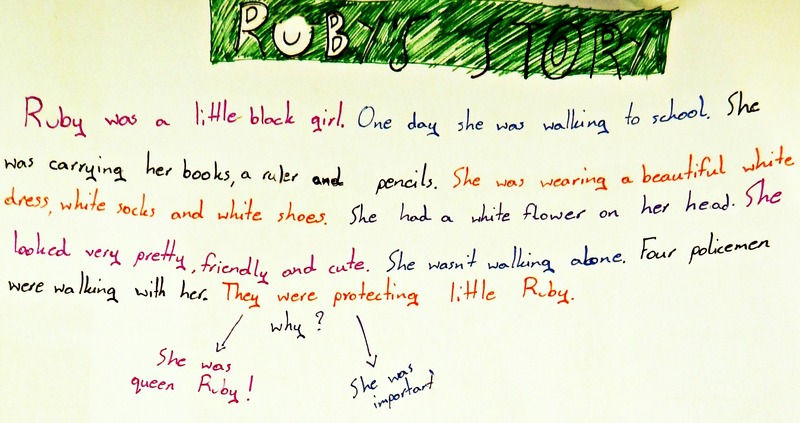 Ask students to work in groups and write the short narrative in Present or Past Simple. Get feedback. Go back to step 2 and to the 3-2-1 Bridge routine. 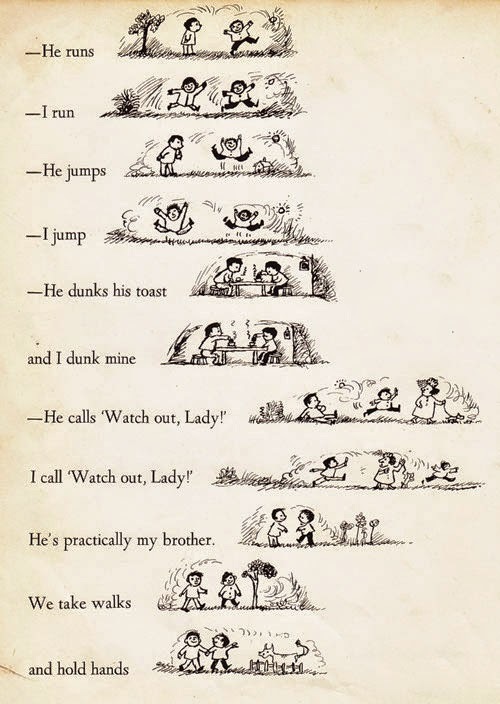 Ask students to write: 3 words, 2 questions and 1 simile when they think about friendship. 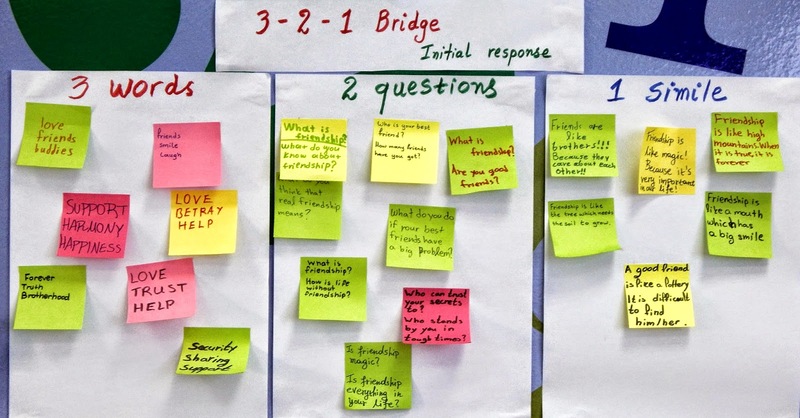 Bridge by sharing ideas and seeing how new responses are similar or different from the beginning. Ask your students: If you had to write a Headline in a newspaper or a magazine about friendship now that would capture the most important aspect of the issue, what would that be? I hope you find this proposal worth experimenting. 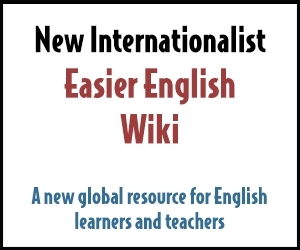 You can have a look at classroom practice here. Description: This proposal is organized around the myth of Europe through the use of a magnificent painting by the Bulgarian painter/illustrator Svetlin Vassilev and an extract from Ovid’s Metamorphosis. 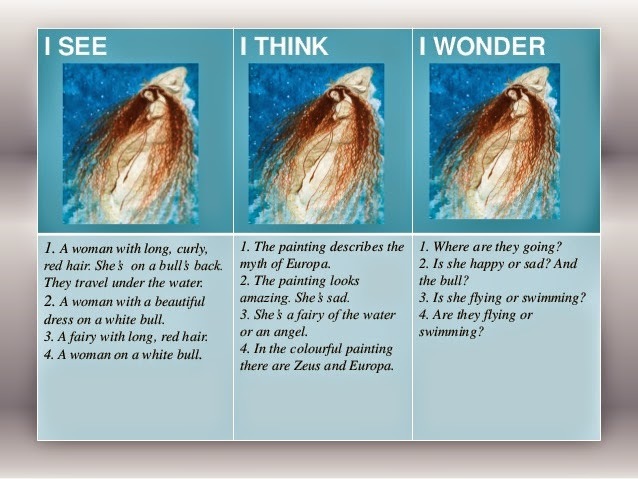 The thinking routine used is See-Think-Wonder. Students distinguish among Myths/Legends/Fairy Tales, practise observing and speaking while reflecting on the myth of Europe. 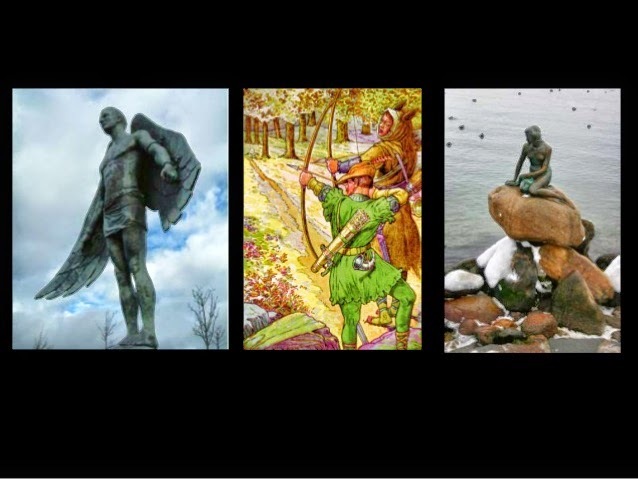 Level:Intermediate+ Learners:11+ Theme: Myths, Legends, Fairytales, Europa myth Language: Simple present, present continuous, past forms Skills: Observing, describing, group discussion, speaking, writing Materials: painting/definitions slides, downloadable worksheets. Show your students Vassilev’s “Europa“. 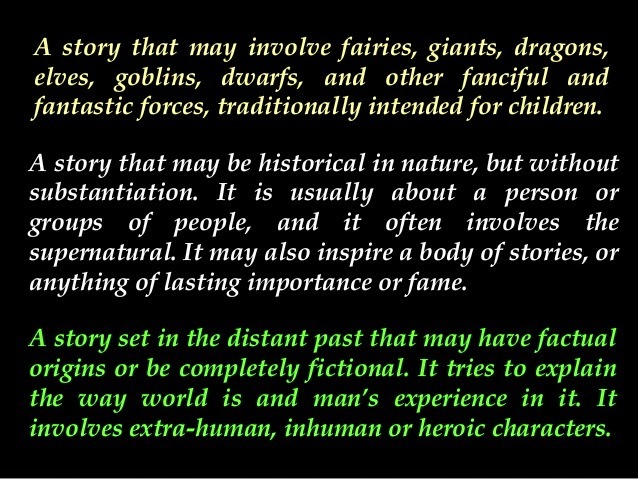 Write on the board: Myth-Legend-Fairy Tale. 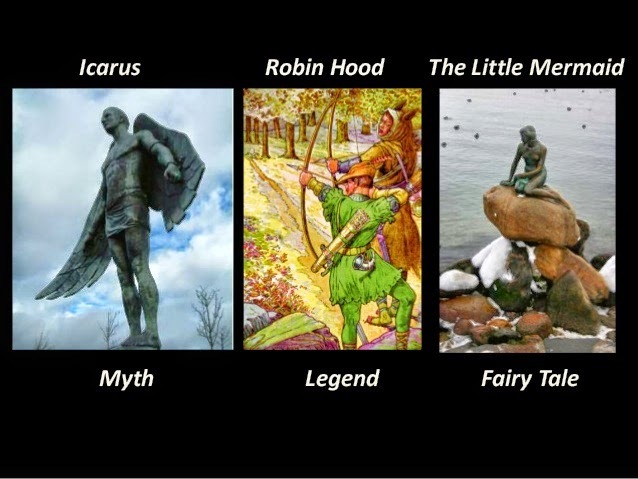 Show your students the slide below and ask them to guess which one is a Myth, which a Legend and which a Fairy Tale. 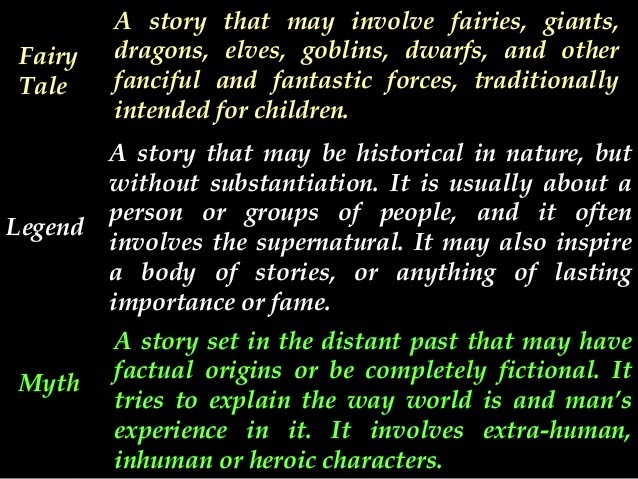 Show the definitions and ask them which narrative form each definition is about. Reveal the title of the painting and the name of the painter. Have them work in pairs to complete the activities in the worksheet. Get feedback. Give students the worksheet with Ovid’s poem and ask them to work in pairs and order the sentences. After reading the ordered poem ask pairs to complete the other 2 activities. Follow up Ask students to write about their favourite myth, legend, or fairy tale. I hope find will this proposal worth experimenting with. 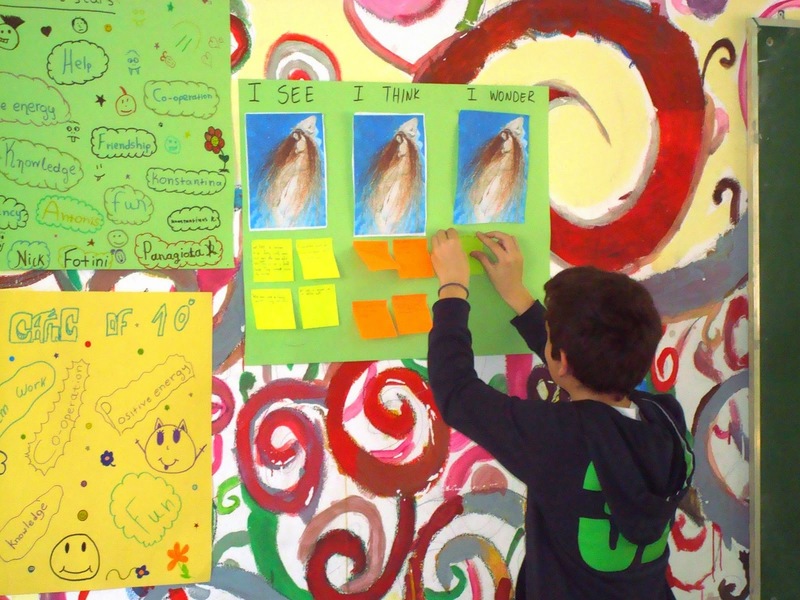 Part of this proposal was realized within the framework of the Teachers4Europe 2012-2013 Educational Programme.